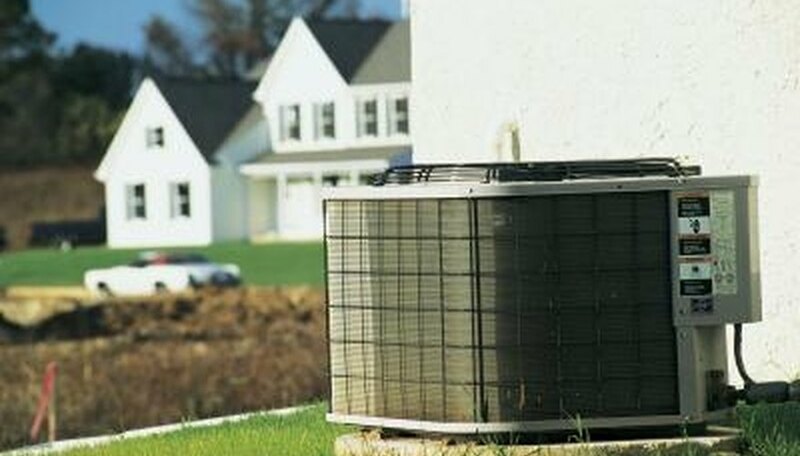 The outdoor sections of two-part air conditioners are heavy, sizable units, and they require a substantial support base. Small concrete slabs are what most manufacturers recommend. A/C slabs or pads are available precast, or they can be poured in place. Although pouring your own concrete slab isn't the most glamorous do-it-yourself project, there is something curiously satisfying about creating such a heavy, durable product from a little water and a bag of mix. Choose an appropriate location for the concrete pad. Ensure that the pad places the air-conditioning unit close enough to the associated piping and electrical service connections. Consult the technician installing the unit if you are in doubt about where to pour the concrete pad. Measure the air-conditioning unit or consult the unit manual to determine the proper size for the concrete pad. Dig a level, flat-bottomed hole 6-inches deep and 3-inches longer and wider than the pad size. Fill the hole approximately halfway with gravel or crushed stone. Use a hand tamper to thoroughly compact the gravel base. Use deck screws and 2-inch-by-6-inch lumber to build a form for the pad. Make sure the interior dimensions of the form match the size you determined for the finished pad. Place the 2-inch-by-6-inch form on top of the compacted gravel. The top of the form should be 2 to 3 inches above the level of the surrounding terrain, or to a height otherwise specified by the air-conditioning unit manual or installing technician. Place a wheelbarrow in a flat, solid area. Empty a bag of concrete mix into the wheelbarrow. Add water per the instructions on the bag and mix the concrete with a shovel, until you achieve a consistency similar to that of chunky peanut butter. Pour the concrete into the prepared form. Immediately mix another wheelbarrow full of concrete, repeating as many times as necessary to fill the form. Use a shovel handle or stick to make sure the concrete settles around the steel reinforcement as well as into the corners of the form. Employ a scrap piece of lumber as a screed. The lumber should reach across the width of the form and rest on the sides. Move the screed back and forth as you run it along the sides of the form to scrape the excess concrete off and level the top. Use a concrete float if desired for a smoother finish. Cover the concrete with plastic sheeting weighted down at the corners with rocks. Allow the concrete to cure for 24 hours before removing the form, and seven days before installing the air-conditioning unit. Be careful when adding water to the concrete mix. Too much water can weaken the concrete.